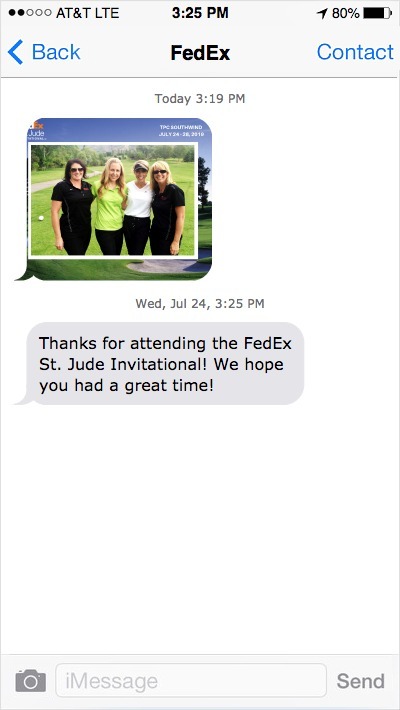 Selfie Lab would be honored to attend your 2019 WGC Fedex St. Jude Invitational event. We feel that it would be a great addition to your festivities and would benefit both your guests and your sponsors. We pride ourselves on professional service, the newest technology, customization, and an overall positive and fun experience for you and your guests. Selfie Lab not only captures great photos with our booths, but we also create custom artwork to specifically match your event to go around the photo as a border. This is a great opportunity to feature your sponsors by placing their logo(s) on the photo border. Selfie Lab is able to give all of the guests their photos in many different ways but the most unique way we are able to provide them is through text message. Guests can receive their images instantly through text message so they can share or post online. On top of quick delivery we are also able to insert a custom message with the text delivery. This can include a website link, hash tag, or any message you would like. This is a great way to expand the social media impact of your event and promote your sponsors. All of Selfie Lab’s booths have attractive eye catching LED lighting and can be branded with any message or logo. We also offer a variety of backdrops including a green hedge wall, simple white, or we can custom make a backdrop with your logo and/or your sponsors. Drive social reach and brand engagement at your next event. Invite guests to participate and create a billboard-sized work of art – live and in real-time, powered by your event’s social media hashtag or our photo booth. Reach new audiences and turn your activation into opportunity one photo at a time.